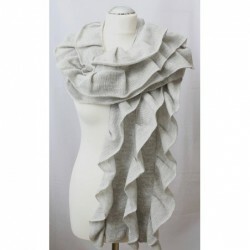 This hand knitted luxurious elegant scarf with flounces is a perfect accessory to keep your neck beautiful and the same time warm. It is made of soft baby alpaca and merino wool yarn thats soft yet breathable! Care instruction: washing water temperature should not exceed 30 C. Dry cleaning recommended, iron on low heat through a cotton cloth, do not bleach or tumble dry.